If you are looking for ways to organize smaller size items, this is the perfect storage place for them. The file's compact size combined with 13 storage pockets allows it to be a great tool for organizing multiple things in one location. 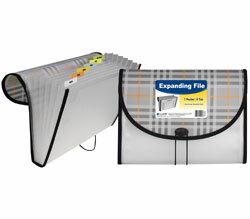 Junior Size Expanding File provides storage for checks, receipts, and more. Includes preprinted tab inserts and button and elastic closure. 13-pockets / 12-tabs . Assorted colors include blue, purple, pink. Made of durable, acid-free polypropylene. For up to 10 inch x 5 inch document storage.